After a very long weekend last week, I returned to work and enjoyed many opportunities to share stories about the adventure that included two commencement exercises in less than twenty-four hours. My children made me proud last week and left me reflecting with amazement about the milestones they accomplished. I was amazed that neither of them love to read book in the leisure even though I read some kind of book to them almost every day from birth until the oldest one started middle school. Back then, they loved our reading time. Somehow I thought their childhood love for listening to me read would translate to anticipation of the next best seller. I thought wrong. I was amazed, however, that reading to them stimulated their curiosities and imaginations in ways I couldn’t predict in their youth. Their mental development prompted curiosity about people, culture, the ares, and their academic fields of interest. I learned that my motivations and intentions for reading to them were too narrow. Time spent with them fortified our relationships and fortified their foundational tools for experiential learning and academic pursuits. 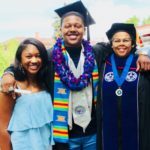 I was amazed that I didn’t realize when they were young that the younger would earn his high school diploma in the same year that the older earned her college degree. The age gap seemed perfect until I had to mail two sets of announcements and find ways to acknowledge each of them for the noteworthy accomplishment. I was amazed that we found a way to celebrate the graduate degree being conferred on the east coast on a Friday afternoon and then the conferring of the bachelors degree on the west coast Saturday morning. I was one proud mama. I was amazed about the wonderful potential of my children. Experiencing their journeys has always given me hope for other young people. My daughter once told me something like she believed that I seemed to believe e that all kids could do amazing things. Amazingly, she was right. Every day students amaze me and spur me to dream for them and dream along with them. I was amazed that childlike excitement was realistic for a middle-aged woman like me for as many times as it was required for me to celebrate accomplishments of any child. I found that my emotions ran the gamut from giddy, hand clapping to tears of joy to shouts of joy rivaled the hallelujahs in a Black Baptist church down south. If you haven’t been amazed by a young person recently, adjust the frequency of the sounds around you in order to give their voices a chance to be heard. Consider adjusting your attitude about the youth in your community so that you can see them in a positive light. If you still can’t find a reason to be amazed by young people, adjust your position and your attitude because the issue is likely yours alone. I really want you to experience the sheer amazement of standing in the presence of our children. Be amazed. Celebrate them and share the narrative that uplifts.